I've never seen a watch made of wood & I probably never will see one like the ones Jord Watches crafts. Jord says they want their watches to tell more than just time, I'd say that these timepieces do tell more than time, it's a conversation starter from people. "Where did you get this watch? ", "That's a beautiful watch", "It's very unusual." Eye catching. 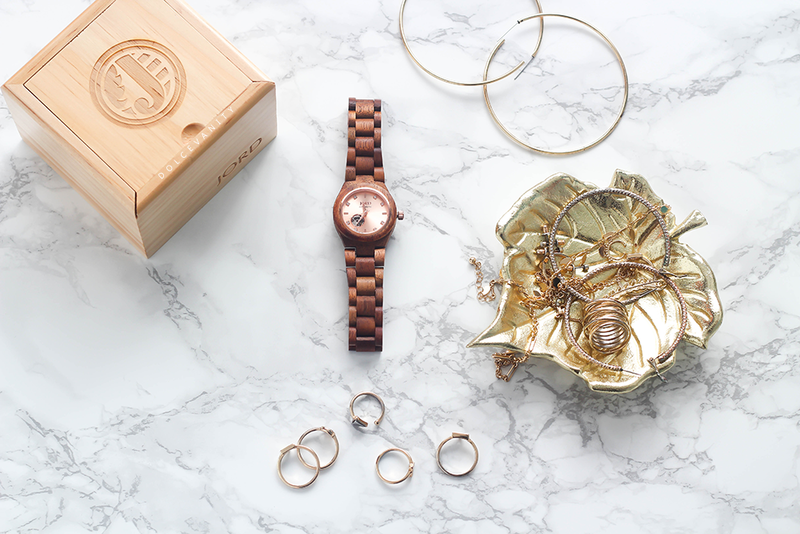 I was sent the Cora Koa & Rose Gold watch, from the Cora series. 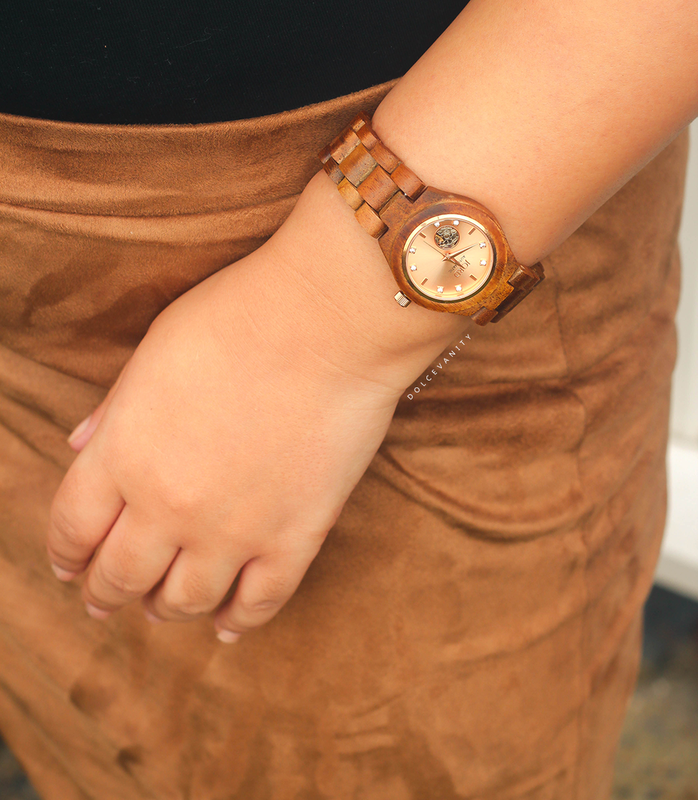 This particular watch is made from Koa Wood. Koa wood is a species from Hawaii, considered to be one of the most beautiful of the native hardwoods. Depending on the time of the year Koa wood will produce tones that range from medium gold to reddish brown, similar to Mahogany. I think Koa wood works well amongst the interface of the rose gold. Before getting the watch you need to size it so they can correctly send your size. On each watch page you'll see a link that says "Size This Watch For Me" you can either use a measuring tape or print one off from their website. You're advised to leave add 0.5 cm to your sizing so that your watch fits comfortably. If I wear my watch a little higher on my wrist it's secure but even if I move it towards my hand it's a little looser but I wouldn't feel weary of wearing it lower because it's still very secure. Jord watches come within a wooden box of it's own, with a slid off top. You'll find your watch inside on a cushion. Included in the box is your warranty card, instruction card, social media card and also a black cloth to clean your watch face. Setting the watch is very easy, on their FAQ they advise to wind the watch at least 15-20 times prior to wearing it. Being that the crown is already pulled out it just needs pulling up more so you can set the time. Once set, just push and hold it back down - simple. With these watches being crafted for males & females, I'm sure everyone will find a watch that'll suit them or someone they know. 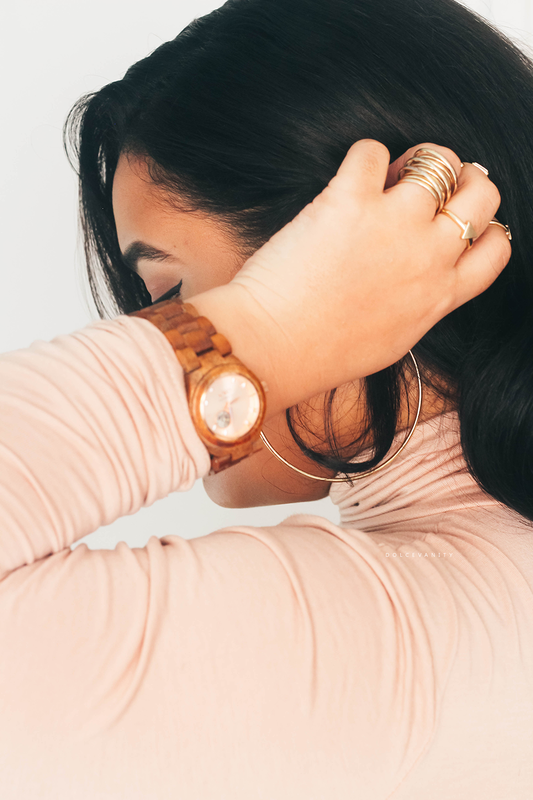 I pretty much love how this watch works with my skin tone & when I saw it in rose gold, which come on, is just a beautiful, delicate but romantic colour - it was a must and I'm satisfied with my choice. 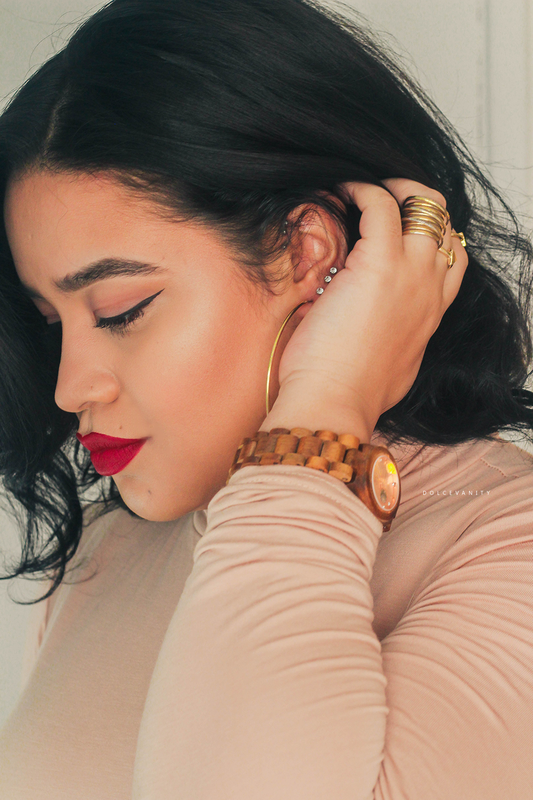 Visit Jord Watches and see what appeals to your eye.